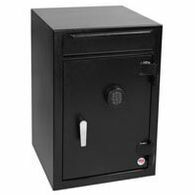 Amsec BWB2020FL Front Loading Depository Safe - Amazing Price! Heavy 1/4-inch steel door with Medeco® high security camlock. 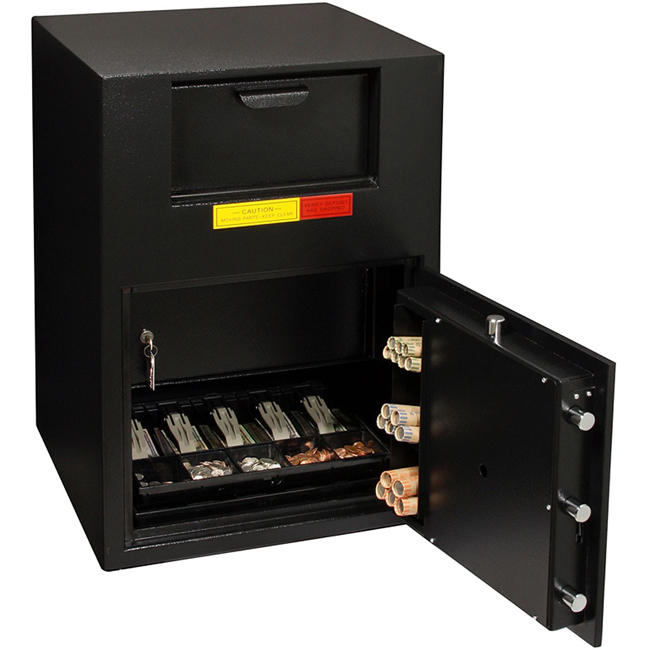 Protected by dual "anti-fish baffles"
Extensive research and development went into the engineering of AMSEC's wide body "B" rate cash handling depository safe. The BWB-2020FL is designed to offer complete cash management versatility with a wide selection of depository options, such as a top, front or rear load depository, one to three deposit slots or a pull-out deposit drawer. This model, the BWB2020FL, has a front load depository drop. 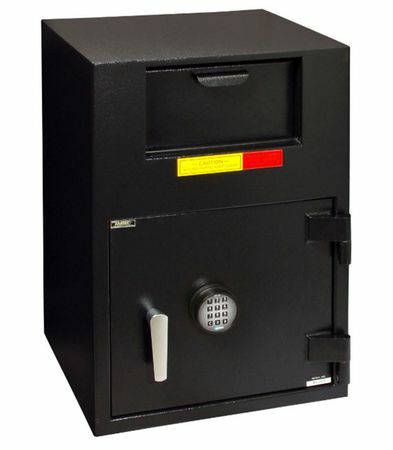 In terms of security the BWB series is B-Rated with its 1/2" thick solid steel recessed door designed to provide excellent protection against pry attacks. The door jamb construction is formed of high-tensile steel and the internal jambs are reinforced on all four sides to provide protection against sledgehammer attacks. The 3-way locking mechanism consists of five massive 1" solid steel chromed locking bolts. Once the bolts are retracted, a bolt detent system keeps the bolts retracted until the door is in the shut position when they automatically engage. On the door lies AMSEC's ESL5 Electronic Lock upgrade that we include free of charge. The lock is also protected by a large carburized hard plate that provides security against drill attacks. 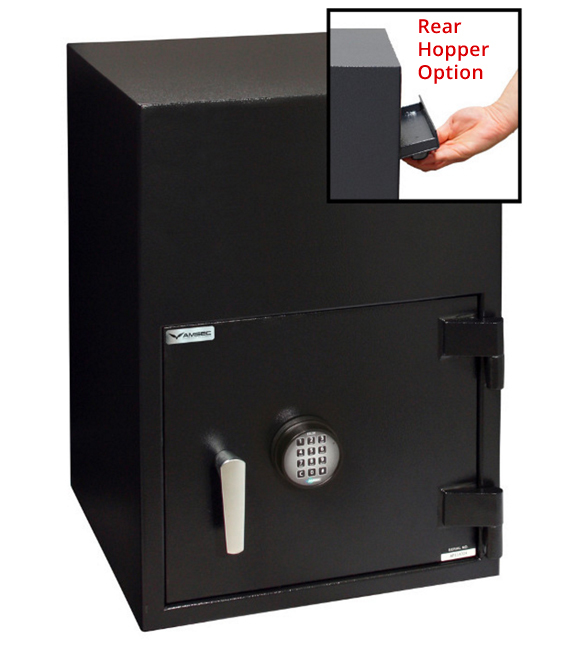 If the burglar is able to successfully drill through the hard plate, the security is enhanced with an auxiliary spring-loaded relocker that secures the bolts in the closed position when severely attacked. 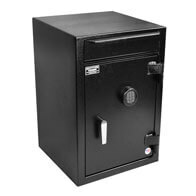 Once inside the door, you'll find an interior locker constructed of heavy 1/4" steel with a single-key camlock with two keys. Beneath that is a convenient, door-mounted, recessed coin rack that makes storing money easier than ever. 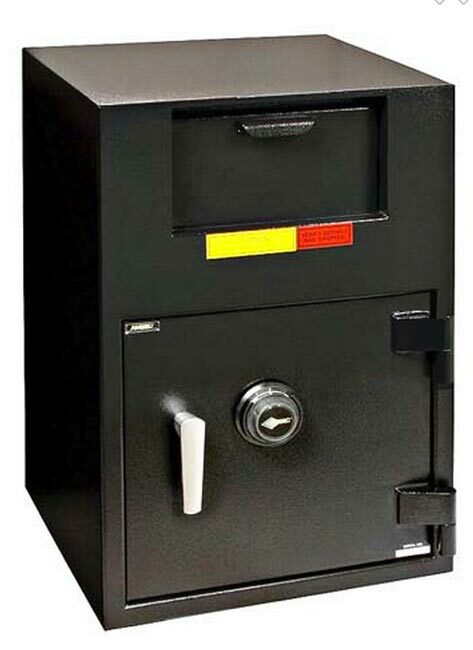 The depository door is a recessed heavy duty 1/8" door protected by dual anti-fish baffles and a maximum capacity of: 4" x 9" x 11-1/2". 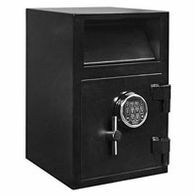 IMPORTANT: AMSEC Depository safes are recommended for any operation that requires a non-returnable deposit such as armored car companies, convenience stores, restaurants, etc. 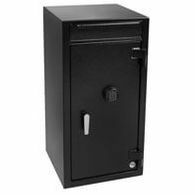 The top locker is not meant for overnight storage of cash or valuables.